Welcome to Friends of Hospice Southwest Washington! Thank you for visiting our website! Friends of Hospice Southwest Washington, with the help of many dedicated volunteers and generous donors, raises funds to help support hospice and palliative care patients and their families through established hospice and palliative care organizations in southwest Washington. Through our fundraising activities, we provide an avenue for members of our community to be able to make a significant difference at a pivotal point in a family’s life. We are proud to state that Friends of Hospice SW Washington raised over $143,000 in 2018 for the hospice cause. Please look around our website for opportunities on how we can all work together paying kindness forward, helping others. We would love for you to become a member and join our team. 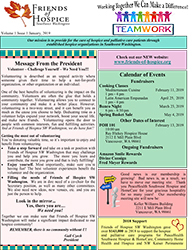 Stay current on upcoming events, read stories and see pictures from past events, and read messages from the president.